A collection of audio files with 12 lectures to prepare you for the Instrument Pilot Airplane knowledge test. They were designed to be used in conjunction with the Gleim Instrurment Test Prep Software and Gleim Instrument Written exam book. The audio lectures can be studied while you are in your car, mowing your lawn, exercising, etc. They allow you to concentrate on the lectures so you can visualize the concepts. Most people can carefully listen to one of these audio lectures and then confidently and correctly answer virtually all of the FAA questions in that chapter. With the audio files you can prepare for and take the FAA knowledge test in less than 20 hours total time. Each chapter should take about 1.5 hours: 30-40 minutes of audio lecture and one hour studying and answering questions in the book or software. Electronic Delivery Only: These WMA or M4A files are only available via electronic distribution. After ordering, you will receive instructions for downloading the WMA or M4A files to your computer or media device. Review: A great accompaniment with the ASA Oral Study guide! The more senses you engage in your studies the more effective the impact and More Lasting! I used all the material to make flash cards and review and listen. Downside; some of the material on the audio was no longer used so I had to edit it out. That is based on the current Gliem study book. Polite helpful people through the whole purchase and navigation of the materials use. Expensive for an audio book, but it was worth it. Pros: It's straight and to the point. Accurate. Review: It's pretty dry but it's hard to find an audio book that helps you prepare for a test that isn't. I actually appreciated that there wasn't a lot of fluff. They just go at it dumping information you'll need for the FAA knowledge exam. I would listen to this on the way back and forth driving to the airport and will probably listen to it here or there to keep me sharp on some of that information over the years. Review: CD's helped out a lot and I would recommend to anyone who doesn't have a lot of time to get in studying. I drive truck for a living so I had plenty of time to listen to them. Worked good! I passed. Review: This product is completely worth the purchase price. Between these CD's and the Gleim Instrument Pilot test guide (and a Sporty's DVD course) and the free FAA publications, I have all I need to get ready for the test. I commute to / from work almost every day, 30 - 40 mins each way and I can easily get one CD in during a daily commute. I have listened to each one about 3 times at least now. They help greatly with all the factual / memorization aspects of the preparation, and this greatly helps make the most pertinent material stand out when reading the morre in depth sources. Review: I've found the gleim CD's and books very helpful. Although I haven't taken my instrument knowledge test yet I scored a 98% using their private pilot courses. I'm sure I'll yield similar results with this audio course. Cons: Needs some editing but no biggie, just buy the Gliem instrument study book to accompany audio. Cons: Kind of expensive for an audio book and it's length. Cons: Purchase the book too. 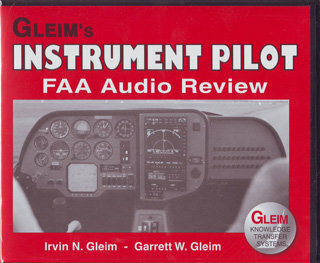 Gleim Instrument Pilot Test Prep Software - Simulated FAA tests for Instrument Pilot Fixed Wing Knowledge Tests. Instrument rating ground school. This new combo package includes standard-definition DVDs, Blu-Ray disks, and Instrument Prepware software. Instrument Pilot Syllabus is a step-by-step lesson plan for your sport pilot training.